Home › Chicagoland Topics › Chicago Mayor Rahm Emanuel boycotting Chicago Arabs? 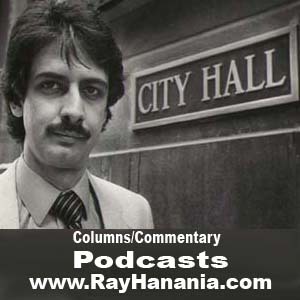 By Ray Hanania — Ask Chicago Mayor Rahm Emanuel if he has a problem with “Arabs” and he’d probably grimace and have you arrested. Well, we know that won’t happen. Not that you wouldn’t be arrested by the mayor for asking such a question but that Mayor Emanuel would never find himself in a position where American Arabs in Chicago would be able to ask him anything. You see, if you haven’t noticed, Mayor Emanuel, the self-professed champion of “diversity” in Chicago, has done a great job of keeping Arabs away from his administration. Emanuel is Israeli and his father was a member of the notorious Irgun, which the British and most historians correctly describe as a terrorist organization. He also volunteered while in Israel to work for the IDF, Israel’s military, though through indirect intermediaries Emanuel has pushed back that he didn’t wear an Israeli uniform or carry a gun, and his service mainly involved working on military vehicles. Chicago Mayor rahm Emanuel. Does he hate Arabs? from Ray Hanania on Vimeo. The Muslim religion is a lot like Christianity and Judaism. There are a lot of different kinds of Muslims. There are about 7 million Muslims in the United States, but only about 22 percent are Arab Muslims. The majority are Black Muslims or members of the Nation of Islam, 38 percent. The remainder are Asian and Pakistani Muslims. Chicago has a large population of Muslims who are Pakistani, Asian and Arab. The problem was only four Arabs were invited to Mayor Emanuel’s Iftar event. Most of the attendees were Muslims of non-Arab background, Pakistani and Asian. Because Americans are so uneducated about the Middle East and things like Muslims, Iraq, Sept. 11th terrorism and other things related, they wouldn’t know that the event did not involve many Arabs. Emanuel didn’t publicize the event much, either. He kept it kind of low key. It didn’t get any major media coverage that I can find although an Indian blogger mentioned it while writing about her love life on her blog MyDatingReality.com. Cheryl Corely at WBEZ Radio did a piece on Emanuel’s first 100 days, which was actually Tuesday August 23rd, not the 24th. There was no mention of meeting with Muslims there. I went to the Mayor’s official Chicago web page where there is a big picture of a lot of people with Emanuel (but no Arab faces) to see if maybe the Mayor issued a press release on his Iftar dinner and meeting with Muslims and non-Arabs. But I couldn’t find anything. In fact, there are no press releases that were released between August 23 and August 26 on the official web site of the City of Chicago or Mayor Emanuel. The section listing on his Speeches includes his campaign blather but ends with his inauguration speech on May 16, 2011. No match found on the entire Emanuel City of Chicago site. When Emanuel was inaugurated, he had Christian and Muslim and a Jewish religious leaders address the gathering. The Muslim he chose to speak was Kareem Irfan, my longtime friend and a great Muslim leader in Chicagoland. Irfan did a great job representing Muslims. But everyone knows that not all Muslims are Arabs. This isn’t about criticizing Muslims, by the way. It is about what Emanuel insists is one of his priorities, “diversity.” He says he wants Chicago to reflect the melting pot that it is. So why are no Arabs involved? Why no meetings with any Arabs? Why the blackout when it comes to Chicago’s Arabs? I have to say that former Mayor Richard M. Daley, after 22 years in office, finally did come around to open his doors to the Chicago Arab community. I often criticized Daley for not doing as much as he could. We have many Arabs working for the City of Chicago but the numbers are far below our proportions as city residents. I never thought I’d say I miss Mayor Daley — though he was a good friend of mine who I met while covering Chicago City Hall for 16 years as a reporter. Daley could have done more but Emanuel is showing us that Daley did far more than Emanuel has done. In fact, I wonder. Is Emanuel afraid of Chicago’s Arab community? Maybe we might ask a question that is embarrassing to him or something? We’ll be good Arabs, Mayor. Anyway, even if an Arab asked an embarrassing question like, “Why did you serve in the Israeli military but not the American military (where thousands of American Arabs like myself did in fact serve — me during the Vietnam War)?” The fact is the anti-Arab Chicago media wouldn’t report it. If hatred rises in the forest of Chicago and no media covers it, is it really hatred? That’s an old expression that if people pretend something doesn’t exist, maybe it will go away. Maybe that’s what Mayor Rahm “Diversity” Emanuel wants. That won’t happen, Mayor. Even if the news media doesn’t want to do its job. ‹ Gabriella Naseem Akhtar van Rij’s "With All My Might"